The game library includes over 1000 online casino games. The browser-based software platform is compatible with mobile devices. The online casino supports multiple languages and currencies. Players can choose from many safe and reliable banking options. Cadoola Casino rewards loyal players through a point-based, multi-level VIP Program. The online casino offers several match bonuses and cash back offers. Players can win large prizes by taking part in tournaments. Cadoola Casino went live in 2017, which makes it one of the newer online casinos in the industry. The online casino operates on an Internet gambling license granted by the Government of Curacao. 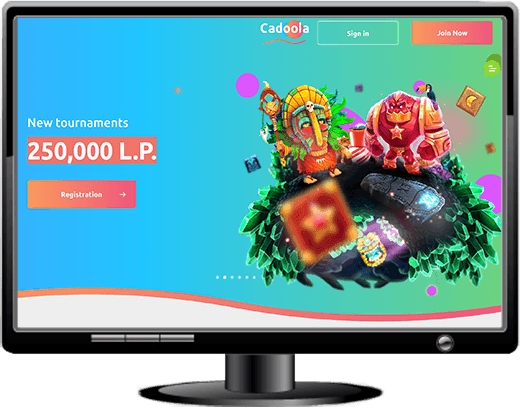 Cadoola is one of the online casinos on the Soft2Bet network. Cadoola Casino gives top priority to customer support, responsible gambling, fair play, and safety & security. The online casino encourages social interaction through Facebook and Instagram. Players have to be above 18 to sign up at Cadoola Casino. Cadoola Casino is one of the online casinos on the Soft2Bet network. All the online casinos on this network operate on a browser-based software platform with mobile compatibility and support for games from multiple providers. Players don't have to download any software client or native gaming app to play these games for fun or real money. Cadoola Casino has displayed its game library right on its homepage. A search bar near the main menu at the top of the casino website allows players to quickly find their favourite games. Players can sort games according to filters such as top lists, new games, popular games, game types such as slots, poker games, live dealer games, roulette games, card games, and others, and game providers. PokiesPlayers will find exciting titles such as Sugar Pop 2, Hit Man, Easter Island, Beauty and the Beast, and Hot Fruits 20 among the online casino's library of over 1000 slots. New GamesPlayers will always find new games in the Cadoola Casino game library. Recently, the online casino added games such as Super Fast Hot Hot Respin, Master Chen's Fortune, Da Vinci's Treasure, 88 Dragon, and Enchanted Cleopatra in its portfolio. Video PokerThe library includes video poker games such as Multihand Bonus Poker, Double Bonus, Poker Pursuit, and All Aces Poker. Card GamesPlayers who love card games can enjoy games such as Split Way Royal, Red Dog, Caribbean Poker, Beat Me, and Baccarat. Live Dealer GamesThe online casino includes 14 live dealer games such as Live Baccarat, Live Three Card Poker, Live Dragon Tiger, Live Roulette, and Fan Tan. Roulette & Blackjack GamesThe library includes 11 roulette variants and 39 blackjack variants to keep fans of these games happy. PokerPlay poker games such as Five Draw Poker, Ride'em Poker, Triple Edge Poker, and Casino Stud Poker. Top ListsThese are the most popular games in the catalogue. Players never appear to get tired of playing games such as Live Roulette, Demi Gods II, Mystic Mirror, Beauty Fairy, Wizard Shop, and Ark of Mystery. Cadoola Casino have recognized the need for mobile game play. As such, you will be able to find a fully responsive mobile lobby when playing from a mobile device. Majority of the mobile platforms are supported. These include iOS, Android and Windows OS. 10 No Deposit Free SpinsThe online casino offers 10 no-deposit free spins on Myrtle the Witch slot. Players only have to create a new account at the online casino to qualify for this bonus. They don't have to make any qualifying first deposit. The online casino, however, considers the free spins winnings as bonus money. Players have to play through the bonus money 40 times before they can request payout. The max cashout amount is €80. First Deposit BonusPlayers who have just made their first deposit can claim a bonus of 100% up to €500 on their first deposit amounts. Players have to deposit at least €20 to qualify for this bonus. The online casino gives away the 200 free spins at the rate of 20 free spins per day for ten days after players receive their first deposit bonus. The first deposit bonus is associated with a number of terms and conditions. Players have to read these terms and conditions before claiming the bonus in order to avoid disappointment in future. The bonus has a wagering requirement of 30x players' deposit plus bonus amount, and the max cashout is €80. Weekly Reload Bonus If players make a deposit of €20 during the week, they become eligible to receive a bonus of 50 free spins. Weekly CashbackPlayers can claim cashback on losses incurred during the week while playing at the online casino. However, the percentage of the cashback bonus the online casino offers varies from one VIP level to the other. Players who have achieved the highest VIP level can claim 15% cashback up to €3000. Weekend ReloadPlayers who load their accounts on Saturdays and Sundays can claim a special weekend reload bonus of 50% plus 50 free spins. They can claim 50% bonus on a reload of €20. If they load €50 in their accounts, they can claim 50 free spins as well. Loyalty PointsThe online casino rewards player loyalty with points, which players can later redeem for bonus credits. However, players can earn points only for real money play on video slots, not on any other games. Cadoola Casino offers a loyalty point for every €100 players wagered on video slots. Players can later exchange 100 loyalty points for one bonus credit. Live Casino CashbackThe online casino gives live casino players 10% cashback of up to €150 on losses incurred while playing live dealer casino games. Cadoola Casino offers customer support services 24 hours per day and 7 days per week. If players visit the online casino's FAQ page, they can see answers to a few commonly asked player queries. Usually, this information is enough to help players get started at the online casino. However, players who still need help can use the following methods to get in touch with a customer support agent. Live Help: Players can click on the green chat icon on the right of the casino website to launch the live chat window. They have to select a department from the dropdown box, input their name and username, and type in a message before clicking on the arrow symbol to initiate chat. Email: Players can also send an email to support@cadoola.com to get a quick response from customer support. Telephone: Players can call the online casino on the numbers 8 (800) 775-34-89 (Russia) and +356-2778-0669 (Europe). However, they will get a response only if they call between the hours of 10:00 and 20:00 GMT+3 on all week days except Saturday and Sunday. Making deposits and withdrawals at Cadoola casino is easy, fast, and hassle free. Players just have to visit the casino cashier, click on “Deposit” or “Withdrawal,” select a banking method, and follow the prompts. Most of the deposit methods offered at the online casino are instant, allowing players to get started with their gambling activities instantly. Cadoola Casino also supports multiple currencies. The online casino processes payout requests in 24 hours. It may request players to submit copies of certain documents for verification purposes. The monthly withdrawal limits vary from one VIP level to the other. Welcome and Classic players can withdraw up to €10,000 per month, Silver players can withdraw €20,000, Gold players can withdraw €25,000, and Elite players can withdraw €50,000. The exact time taken for the funds to reach player accounts depends on the preferred payout method.